What a beautiful location! 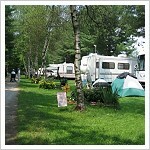 The campground is on small lake way up in northeastern Vermont, near the Canadian border. We stayed here for several days last August. Lakeside Camping is very quiet, except for an occassional train. There are a good number of sites right along the lakeshore. The sites near the lake are mostly open with a few smaller trees. There is a more wooded section of the campground with many sites overlooking the lake. Sites are a comfortable size, and level. The interior roads need a bit of work though… there are some deep ruts and large stones. The park employees are very friendly and accommodating. The facilities are clean, but a little old and need to be upgraded. For activities, there’s swimming in the lake, a small game room and a good size playground. There are also some planned activities during the summer. The fishing is good and you can rent a dock. They also have lovely sunset cruises. This is a great getaway park… we plan on returning this summer.